Here are a selection of easy birthday party food ideas that not only taste great but look yummy too! These sweet treats are guaranteed to make your birthday tea "tip-top-tastic"! These really are a cinch to make and all kids (and most grown ups) love them. Gently heat the butter in a saucepan. When it is nearly melted add the syrup, sugar and cocoa powder. Add a couple of handfuls of cornflakes or krispies and stir just hard enough to mix in but not so roughly that you break up the cereal. Be firm but fair! If needed add additional small amounts of cereal until you have a good claggy mix and all the cereal is covered. Put a spoonful of the mixture into paper cake cases. These colourful jelly boats are always a hit at birthday parties. Take some larges oranges and cut them in half. Scrape and squeeze out the inside taking care not to pierce the skin. Make up any fruit flavoured jelly according to the packet instructions. 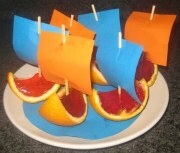 3 large oranges to 1 packet of jelly mix is usually about right and that will make 12 boats. Place the orange skins on a baking sheet (or in the tart holders in a tart / muffin tin to stop them tilting) and fill with the melted jelly mixture, making sure they are full to the top. Refrigerate until set. Once they have set cut the oranges into 1/4 wedges using a sharp wet knife. Attach a paper sail to each boat with a cocktail stick. Organising a pirate party? Add a skull and crossbones to the sails and turn them into "Jelly Jolly Roger Boats". Put the biscuits between 2 clean tea towels and break into uneven crumbs with a rolling pin. Gently melt the butter and syrup in a pan. Stir in the cocoa powder, raisins and nuts. Press down firmly filling in all the corners to form an even base. Spread the melted chocolate over the biscuit base and chill in a refrigerator for about an hour. One of the most traditional and fun kids birthday party food ideas. Every child will want one of these neat little biscuits on their plate. Simply take any suitable biscuits or cookies either home-made or shop bought. Add a liberal smearing of sugar icing. Add a jelly baby sweet. Tip - you may like to trim the back of the jelly baby so it lies in bed properly. This idea can be easily adapted for particular party themes. for instance "Bats in Bed" on orange icing at a Halloween Party or "Teddy Bears In Bed" at a Teddy Bears picnic party. These bars are sticky and sweet. Perfect for birthday parties. Pour the mixture into your baking tin and smooth the surface. Kids birthday party food ideas should always be a little different. OK you wouldn't want them eating this every day but hey its a party! You're party tea can't just be sweet things. Check out these tasty savoury treats! 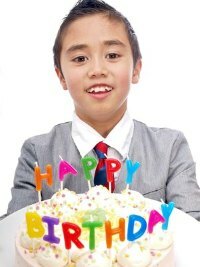 Do you know any great kids birthday party food ideas? Or does your family have a special treat they always use?